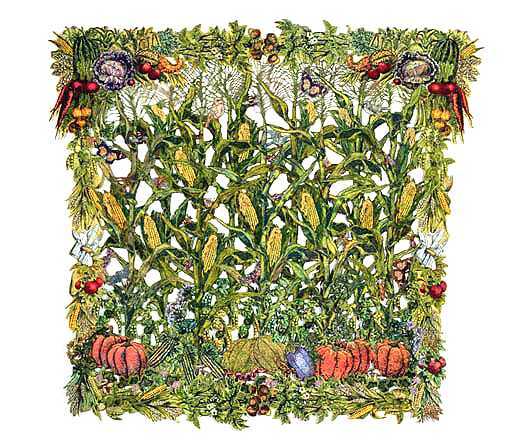 Today, November 26, the Organic Consumers Association gives special thanks to the indigenous farmers and wildcrafters of the Western Hemisphere for cultivating and preserving our food, fiber, medicinal herbs, and biodiversity for thousands of years. We also bow our heads to our contemporary farmers, gardeners, ranchers, farm workers, food workers, cooks, and holistic healers who are following the ancient Via Organica, the organic way. As we give thanks to our organic ancestors and contemporaries, let us renew our essential pledge as organic consumers and activists to protect and safeguard the global commons. Let us pledge to build a healthy organic future of peace, justice, sustainability, and participatory democracy. Let us promise one another today that we will rescue and re-stabilize our climate, clean up our air and water, rebuild our soils, and protect our precious biodiversity from the ravages of "profit-at-any-cost" corporations and indentured politicians and scientists. Seventy-five percent of the food and fiber we grow today was discovered and cultivated by the native farmers and hunter-gatherers of North, Central and South America. These indigenous varieties include corn, beans, peanuts, cotton, potatoes, tomatoes, chili peppers, avocados, blueberries, cranberries, strawberries, squashes, black walnuts, pecans, chocolate, tobacco, rubber, sunflowers, and medicinal herbs and plants. Today, every one of these varieties is threatened by Monsanto, Big Pharma, and industrial agriculture, among others, who are privatizing and patenting seeds and the gene pool, eroding biodiversity, degrading the soil and water, contaminating the food chain, and destabilizing the climate. In "Pristine Nature: The Founding Falsehood," Steven H. Rich explains that what European colonists mistakenly described as wilderness was actually a human-created and nurtured landscape, providing food, medicinal herbs, bountiful wildlife, healthy, living soil, and clean water. Native Americans "managed" the environment "organically," producing and/or maintaining for themselves and the future generations native animals, birds, fish, berries, nuts, greens, fruits, bulbs, corns, mushrooms, roots, basketry and cordage materials, firewood, hunting and building materials, herbal medicines, and plants for ceremonial use. Many "wild" or commercial plants or varieties that exist today are in fact derived from ancient Native American seed saving and cross-breeding that produced better-tasting, climate adapted, and nutritional varieties. The popular belief that pre-Columbian America was a "pristine wilderness" is false. This destructive myth is based upon essentially racist stereotypes that reduce the highly successful plant and animal husbandry of Native American rural societies to the instinctual behavior of wildlife or "noble savages." Native American elders remember better times. "The white man ruined this country," said Southern Sierra Miwok elder Jim Rust. "It's turned back to wilderness. In the old days there used to be lots more game: deer, quail, gray squirrels and rabbits." be no spontaneous organic or green revival, nor magical climate re-stabilization. An organic and healthy life for the present and future generations will require the dedicated work and perseverance of millions. In the near future we will either stop the deadly assaults on our biodiversity, our food chain, our health, and our climate, or else the biological carrying capacity of the Earth will collapse, along with "modern civilization" as we know it. Today, indigenous farmers remain the custodians of an immeasurable wealth of biodiversity. On the Colorado Plateau farming has been an unbroken cultural tradition for at least 4200 years. The Navajo, Zuni, Apache, Hopi, Paiute and Tewa have cultivated the most diverse annual crop assemblage in the New World north of the Tropic of Cancer. Some of the very same fields documented as cultivated four centuries ago by Zuni (and perhaps by Hopi) remain in use today, without soil erosion, nutrient depletion or salination noticeably diminishing their food producing capacity. The 30 ecosystem types on the Colorado Plateau collectively harbor some 2,500 vertebrate species, well over 1,100 invertebrate species, and over 16,000 plant species. Despite the Anglo-American bias of assuming that this diversity is associated with “pristine” landscapes, it is more likely due to the traditional land use practices of the people who have managed the landscape for centuries. For instance, of the Colorado Plateau's 300-some endemic plants, roughly 2/3 (188) have been kept in fields, orchards and corrals by the region's indigenous farmers and ranchers. You can learn more about the Little Colorado River Watershed (Arizona, USA) on the Food and Agriculture Organization of the United Nation's Globally Important Agricultural Heritage Systems site. Today, the indigenous people of the Colorado Plateau are passing their agricultural traditions to a new generation. In September, students at Zuni High School won two first-place and two third-place ribbons at the New Mexico State Fair. The student's state fair entries included produce from the horticulture class's "waffle gardens," a traditional Zuni method of garden construction consisting of a series of parallel, square or rectangular depressions dug into the ground, creating a waffle-like pattern that maximizes use of water. Students from the STAR School, located just off the Navajo Reservation near Leupp, Ariz., and residents of the Village of Hotevilla on the Hopi Reservation created a gardening project where students learn food and farming traditions by helping Hopi elders tend their gardens. The farming system of the Wayana in French Guyana is based on diverse and flexible cultivation, with a characteristically high biodiversity. Organic agriculture and permaculture form a rich, biologically complex system of food production, complimented by wildcrafting, fishing, and hunting. The main crops are cassava (70 varieties recorded) and sweet potato (13 varieties). Farmers protect weeds that serve as pest repellents, food and medicines. For the Wayana, there is no artificial separation between cultivated and wild areas, which is the basis for what we call permaculture. Cassava is grown in gardens. The Wayana clear a parcel of the forest and then burn it. The ashes fertilize the poor soil. After about two years, the field is left fallow so that the forest can grow back, and a new parcel of land is cleared. Fish and eels are caught by bow and arrow, and the Wayana each eat a pound a day. Fish and meat are smoked on a buccan, a sort of grill. Men hunt and bring back toucan, wild pig, deer, iguana, armadillo, sloth and other meat. The food is always heavily spiced with red peppers. Children love iguana eggs. Between meals, people eat coconut meat, bananas, cashews, pineapples, papayas and mangoes. You can learn more about the Agrarian System of the Wayana on the Food and Agriculture Organization of the United Nation's Globally Important Agricultural Heritage Systems site. Few regions in the world have an organic farming system as sustainable and productive as the traditional milpa or "three sisters" organic corn fields of Mexico and Central America. In fact, the UN's Food and Agriculture Organization describes it as "the most evolved farming system in the world." It creates relatively large yields of food crops without the use of artificial pesticides or fertilizers, and is self-sustaining. The Mayan milpa tradition is the planting of heirloom varieties of corn in mounds or raised beds, intercropped with biologically complimentary species such as beans and squash, fertilized through natural processes, weeded, harvested and hulled by hand and tended individually. The ancient milpa tradition has produced traditional varieties that are much healthier and more pest-resistant than modern chemical and water-intensive hybrid and GMO varieties. 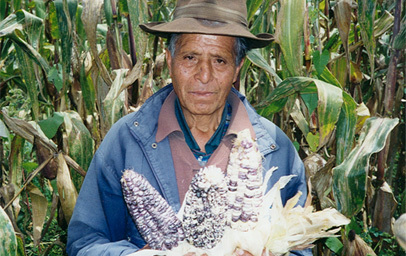 Milpa crops are nutritionally complementary. Corn lacks the amino acids lysine and tryptophan, which the body needs to make proteins and niacin, beans have both lysine and tryptophan, and squash provides an array of vitamins. According to the FAO, the milpa, in maintaining soil fertility, providing a variety of healthy foods, and limiting environmental impacts of food production, may well be one of the most successful human inventions ever created. 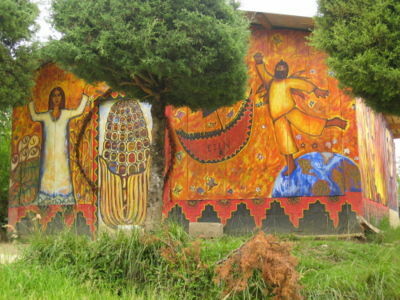 You can learn more about the Milpa Traditional Agroecosystem in Los Altos of Chiapas (Mexico) and Los Cuchumantanes of Huehuetenango (Guatemala) on the Food and Agriculture Organization of the United Nation's Globally Important Agricultural Heritage Systems site. A long list of cultural and agriculture treasures from the Inca civilization has been carefully preserved and improved over centuries to guarantee living conditions over 4000 meters above sea level. One of the most important and sustainable features of Andean agriculture is the terracing system used to capture water and prevent soil erosion. Terraces allow cultivation on steep slops and in different altitudes. From a range of 2800 to 4500 meters, three main agricultural systems can be found: corn is cultivated in the lower areas, potato mainly at medium altitudes. Above 4,000 meters the areas are mostly used as rangeland, but can still be cultivated with high altitude varieties as well. In the high plateau, around Lake Titicaca, farmers dig trenches (called "sukakollos") around their fields. These trenches are filled with water, which is warmed by sunlight. When temperatures drop at night, the water gives off warm steam that serves as frost protection for several varieties of potato and other native crops, such as quinoa. You can learn more about Andean Agriculture on the Food and Agriculture Organization of the United Nation's Globally Important Agricultural Heritage Systems site. The Archipelago of Chiloé, in the south of Chile, is an extraordinary biodiversity reserve: its temperate rainforests hold a wide range of endangered plant and animal species. The Chilotes – Huilliche indigenous populations and Mestize – still cultivate about 200 varieties of native potatoes, following ancestral practices transmitted orally by generations of farmers, mostly women. 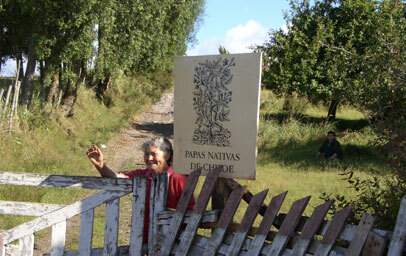 Chiloe Island is one of the world's few centers of origin of crop diversity. Potatoes, mango and strawberries originated here. Although grassroots opposition has stopped Monsanto's attempted invasion of these regions with its genetically engineered potatoes, constant vigilance and struggle will be required. You can learn more about Chiloé Agriculture on the Food and Agriculture Organization of the United Nation's Globally Important Agricultural Heritage Systems site. Accepting the magnitude of the Indian impact on the landscape seems to push us toward the nomos side. In 1983 Cronon laid out the history of the New England countryside in his landmark book, Changes in the Land. In it he observed that wilderness as it was commonly understood simply did not exist in the eastern United States, and had not existed for thousands of years. (A few years later, Denevan referred to the belief in widespread wilderness as "the pristine myth.") when Cronon publicized this no-wilderness scenario in an article for the New York Times, environmentalists and ecologists attacked him as infected by relativism and postmodern philosophy. A small academic brouhaha ensued, complete with hundreds of footnotes. It precipitated on of the only books attacking postmodern philosophy ever written largely by biologists. Another book, the Great New Wilderness Debate, published in 1998, was edited by two philosophers who earnestly identified themselves as "Euro-American men ... whose cultural legacy is patriarchal Western civilization in its current postcolonial, globally hegemonic form." It is easy to tweak academics for their earnestly opaque language, as I am doing. Nonetheless the philosophers' concerns are understandable. The trees closing over my head in the Amazon furo make me feel the presence of something beyond myself, an intuition shared by almost everyone who has walked in the woods alone. That something seemed to have rules and resistances of its own, ones that did not stem from me. Yet the claim that the forest was shaped by people does not seem to leave room for anything else, anything bigger and deeper than mankind. Understanding that nature is not normative does not mean that anything goes. The fears come from the mistaken identification of wildness with the forest itself. Instead the landscape is an arena for the interaction of natural and social forces, a kind of display, and one that like all displays is not fully under the control of its authors. Native Americans ran the continent as they saw fit. Modern nations must do the same. If they want to return as much of the landscape as possible to its state in 1491, they will have to create the world's largest gardens. Gardens are fashioned for many purposes and with many different tools, but all are collaborations with natural forces. Rarely to their makers claim to be restoring or rebuilding anything from the past; and they are never in full control of the results. Instead, using the best tools they have and all the knowledge they can gather, they work to create future environments. if there is a lesson it is that to think like the original inhabitants of these lands we should not set our sights on rebuilding an environment from the past but concentrate on shaping a world to live in for the future. Indigenous Permaculture is a grassroots organization that supports community food security to revitalize ecological health. Revitalize Native and local communities through indigenous science, land stewardship, sustainable agriculture, community food security, and sustainable development. Promote awareness of human impacts on the natural environment and on Indigenous communities when unsustainable choices are made. Use locally-available resources and demonstrate the power of conscious choices to create self-sufficient communities that care for and preserve Mother Earth. Indigenous Permaculture shares traditional farming practices and applies environmentally and culturally-appropriate technology, with the ultimate goal of community food security, and does this work in an affordable way that builds capacity within the community. Indigenous Permaculture provides holistic support to design and implement community food security projects, inspired by indigenous peoples' understanding of how to live in place. Will Monsanto Launch another 'Sneak Attack' in Congress? The 'Monsanto Rider': Are Biotech Companies About to Gain Immunity from Federal Law?